This walk: 2012-8-8. 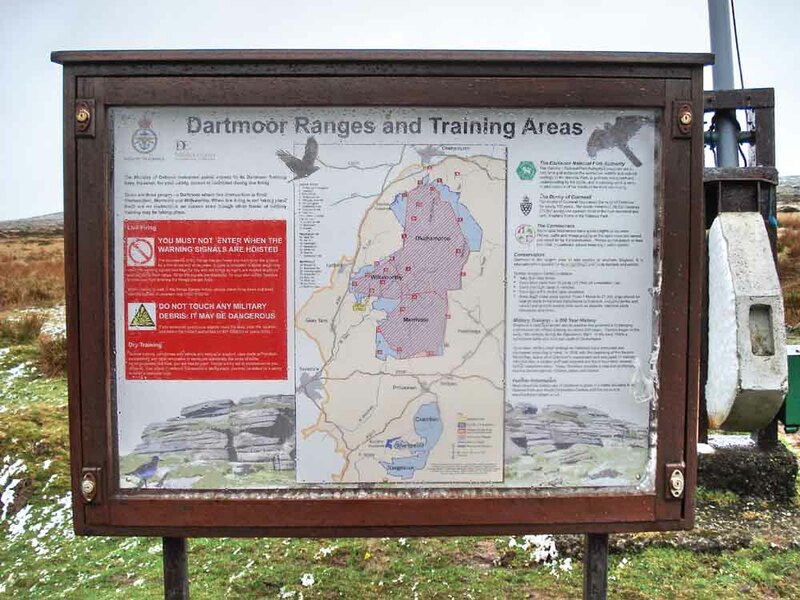 Sheep, Willsworthy Firing Range hut, Wheal Jewell Leat, Ger Tor, Reddaford Farm, firing range features, bog asphodel, cross-leaved heath, Yellowmead farm, WD 37 military range boundary stone, Lich Way, common polypody, Willsworthy Manor Pound, Lower Willsworthy. Link to Google Satellite view of the area - the car park is approximately in the centre of the map. Lane Head car park sign, just up the lane from Lane End (cottage) on the southern edge of the Willsworthy Firing Range (no red flag flying today, it being August). They were being driven by two sheep dogs while the farmer followed in a Land Rover. Willsworthy Firing Range, hut seen up close on 20th April 2011. 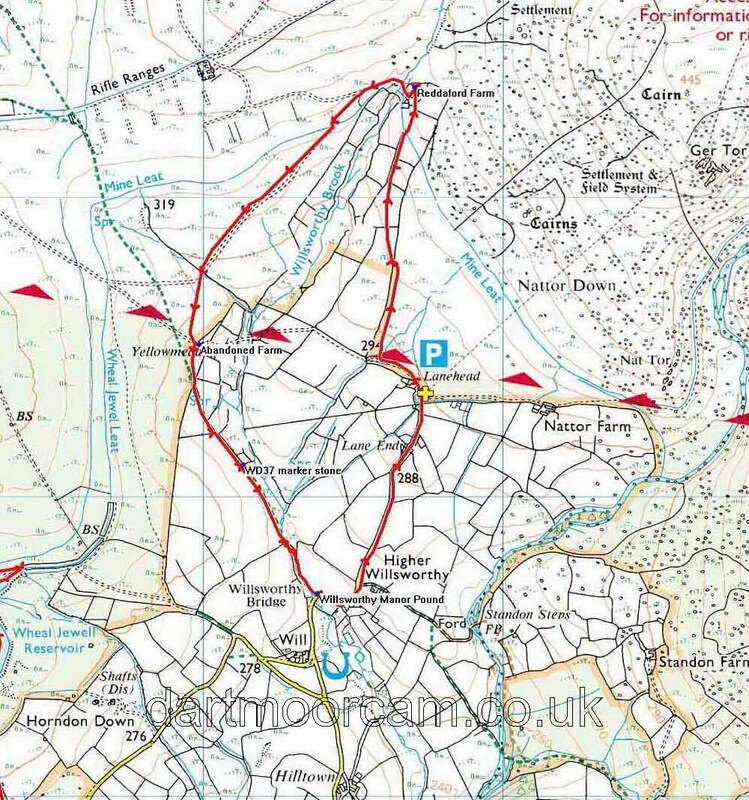 "Mine Leat" on the map, becoming Wheal Jewell Leat (see 20th April 2011). View of the structure of the leat bank in this area. Ger Tor, 546 830, elevation 430 metres (1410 feet) at the entrance to Tavy Cleave which is over the hill from here. Closer view, they were big drops of water. Here beginneth the lesson at Reddaford Farm, Willsworthy, an old abandoned farm: this stone is believed to be the back of the old fireplace. The link leads to a wealth of information, being a report by Dr Tom Greaves, who we met in the car park before this walk! An overview of the remains of the old farmstead. The earliest definite record of a dwelling here is from 1334 and there is an earlier reference to the name from 1242 AD. A view from the farm looking west - or slightly north of due west. The other face, possibly still showing signs of ages-old soot. Feature in a nearby field, old lazy beds? Starting off across the "orange field". "The house on the hill" - seen up close 1st September 2010. Possible old tin mine workings, where nothing grows, or old firing points - looking similar to the previous photo and in the same area? On further thought, the bare patches are probably old firing points, gravel-filled, as seen on 20th April 2011. Cross-leaved heath, Erica tetralix - also, see HERE for a comparison of the heathers. Yellowmead Farm, long abandoned, not to be confused with Yellowmead Farm (painted yellow) at Merrivale or the Yellowmead Down multiple stone circle, near Gutter Tor and the Scout Hut. This abandoned farmstead is on private land. Click the photograph to see a larger version. A notice denoting that we had joined the Lich Way of Way of the Dead, shortly after Yellowmead Farm. A tree with a colony of Common Polypody, Polypodium vulgare. Willsworthy Manor Pound where non-local livestock was impounded after round-ups until the owner appeared and paid a fine to reclaim their livestock, seen previously on 31st March 2010 - this walk passed the WD 40 stone, also 37 (seen above) & 38! Bridge seen along the way - was it for getting a large lawn mower over an 'obstruction'? This walk was accessed via the roads from the turn-off beside the Mary Tavy Inn pub (just south of Mary Tavy), following signs for Horndon, through Zoar, and then Lane End. Parking was at the P symbol on the map, a fair-sized car park.